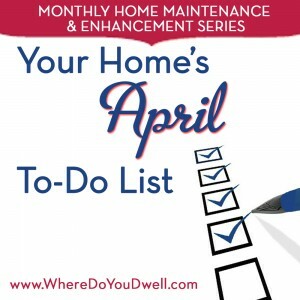 Here’s the next installment of our monthly series, “Your Home’s To-Do List.” We spotlight what home tasks you should tackle at this particular time of the year. In addition to our basic maintenance reminders, we also suggest ways to increase your home’s value and how to “Dwell” happily! “April Showers Bring May Flowers” is an apt saying to describe most DC spring seasons. Is your home and yard ready for you to enjoy the beautiful blooms and blue skies as April ends and May begins? If not, there is still time to tackle several projects during the next few weeks until the heat of summer hits our region. After completing any home project and crossing it off your to-do list, the satisfaction you feel will enhance your total enjoyment of your home … we promise. Break down bigger, time-consuming projects into smaller chunks of time. Set aside 2 -3 hours for a project so you can still enjoy the rest of the day. Keep it manageable. Delegate to different family members based on interest and skill level. Even your kids can help weed or hose down patio furniture. Make it a fun “family” project. And, if you love to garden and another family member likes to clean (yes, some do! ), then assign tasks that complement this. Reward yourself and others afterwards to keep motivated while working. Go get ice cream, get a pedicure, go to a movie, or have a nice cold beer with your feet up. You can treat yourself after a project is fully completed or after you’ve just finished your 2-hour timeframe. You decide! Savor the sense of accomplishment when caring for your home. That’s what is so great about being a homeowner – feeling proud of your home and the love you have for it. It’s YOU who can create a home that becomes a sanctuary for yourself and your family. Have a goal in mind for “why” you want to do a certain project. Do you want to make some additional money from a yard sale? That should inspire you to declutter and go through closets. Do you want to host your family during the next big holiday? That may spark some ideas on creating more room to make guests comfortable or painting your dining room a trendy new color. Do you want to have friends over for a BBQ? That could help you get your “green thumb” working in the garden. You should have tackled some yard work last month. If not, see our March To-Do List so you can finish up these “first step” projects before you take on the ones below. These all depend on if we’ve seen the last days of frost! Seed and fertilize your lawn. Don’t cut your lawn too short yet! Be selective and careful when pruning trees and shrubs. Check with your garden center on the best way to prune. You can prune nonflowering trees and shrubs and also summer and fall flowering trees and shrubs (crepe myrtles). Wait until azaleas, camellias, and rhododendrons finish blooming before you prune. Plant, divide, and transplant perennials. Soil is more workable as the days get warmer and wetter. It should crumble in your hands and not be frozen or soggy. Make note of the hours of sun and shade for your yard in order to buy perennials that will thrive. Plant some annuals in containers and pots to bring color to your patio, deck, or porch. Pansies do well on the cool spring days of April and early May. Switch to summer annuals as we head into Memorial Day weekend. Plan out your garden beds BEFORE you purchase annuals or perennials. Don’t go over budget or overboard when your go to the store. You may end up with too much or too little for your flower beds. Remember to buy what you need, what you have room for, and what you know you can actually care for if you have a busy schedule. Mulch, mulch, mulch if you haven’t already. Need we say more?! Create space for a vegetable garden or herb garden. Even a small patch of land or containers on your deck can yield the fruits of your labor, such as tomatoes and basil. All you need to do is buy the mozzarella for a Caprese salad… yum! Consider a composting bin to help enrich the soil for your garden. You can put cut grass, weeds, leaves and organic waste (i.e., kitchen vegetable scraps) in the bin. It can take from 3 to 12 months to produce compost. Once complete, you can add it to your soil. Get fencing and decking built or maintained. It’s a good time to have a fence put up or deck built. Again, the soil is very workable. Schedule a contractor now so you can enjoy either sooner than later. Now’s the perfect time to make sure your AC is working properly. Whether you have a central air conditioning unit, window units or wall units, you need to them to be ready to get your home cool pronto when the heat hits DC! Get your central AC unit serviced now by HVAC professional. A yearly tune-up will keep it running. Keep this unit, which is located outside, clean and free of leaves and debris. Trim any shrubs away from the unit since it needs circulation space. Set up your window unit or wall unit. Make sure you clean it once a month when using it – vacuum dust and dirt around it to prevent clogging, and change the filter. Remember to cover your window unit if you don’t remove it after the season. The wet and warm days of spring can be both a blessing and a curse for homeowners. The greener grass and blooming flowers nourished by the sun and rain makes you want to spend more time in your yard. But, you might be dealing with more pests who thrive when it gets warmer. Keep mosquitos from breeding in your yard. Wet warm days are a haven for mosquitos since they love standing water – any amount! So do your part to cut down on places where they can breed. Double check for standing water in your yard and any outside containers – such as wheelbarrows, flowerpots, buckets, watering cans, garbage cans, kids’ toys. Store such items in your garage and shed as much as possible. Be proactive about mosquitos, especially if you have a rain barrel, ornamental pond, or bird bath. Take protective measures for mosquito control to prevent larvae from flourishing. Look into non-toxic solutions such as nonchemical larvicides; goldfish, koi, and mosquitofish that prey on these pests; and other solutions to make the water “move” more. Don’t forget to buy some citronella candles for when dining outside! Hire a pest control company to help combat rat infestations, ants, spiders, mosquitos. No one likes to admit that the DC metro area has rats, but we do! Work with a company and take measures in your own yard and home so you don’t make it too welcoming to these creatures. Plus, there are nontoxic ways to deal with pests. Be smart about your garbage containers and animals. Raccoons, squirrels, rats, and other small animals can be attracted to leftover food in your garbage. Make sure your container closes properly and doesn’t have any large holes. Never overload your garbage (yep, diapers do take up lots of space) and have it spilling out. You’re just asking for trouble! Create more privacy for a retreat-like sanctuary. You may love your next-door neighbors, but sometimes you want to enjoy being outside but still feel secluded. If you have a front porch, think about flowing curtains, a beautiful screen, or framed stained glass/mosaic design to block the neighbor’s porch. Tall shrubs and climbing plants on lattice boards can make you feel lost in foliage. Decorate with an outdoor sofa, bistro table with chairs, and outdoor rug. Look for less expensive options out there to turn your deck, porch, patio into a daily living space. Make it a space to enjoy your morning coffee, to stream your favorite TV show under the stars, to work on your laptop in the fresh air, or to entertain friends for your very own “mixology” happy hour. Create usable space just like any other room in your home! Build a pallet hammock, pallet swing, or pallet chair etc. Yep, pallets are an inexpensive way to build some fun furniture for your yard. Make it cozy and colorful with cushions. Check out some more ideas here. Set up a children’s swing set, treehouse (check zoning laws!) or fun play area. With more daylight hours and warm days, it’s the perfect time to make the outside a new playroom for your kids (or even for you!). Light up your outdoor space. Outdoor lights are very trendy now so you can find inexpensive ones from Target, Homegoods, and Lighting can set a mood and makes your yard sparkle and shine. So many ideas to choose from: string lights for patios and screened porches, solar lights along your garden beds or walkways, festive twinkling party lights on potted shrubs, LED lanterns for side tables, and more!